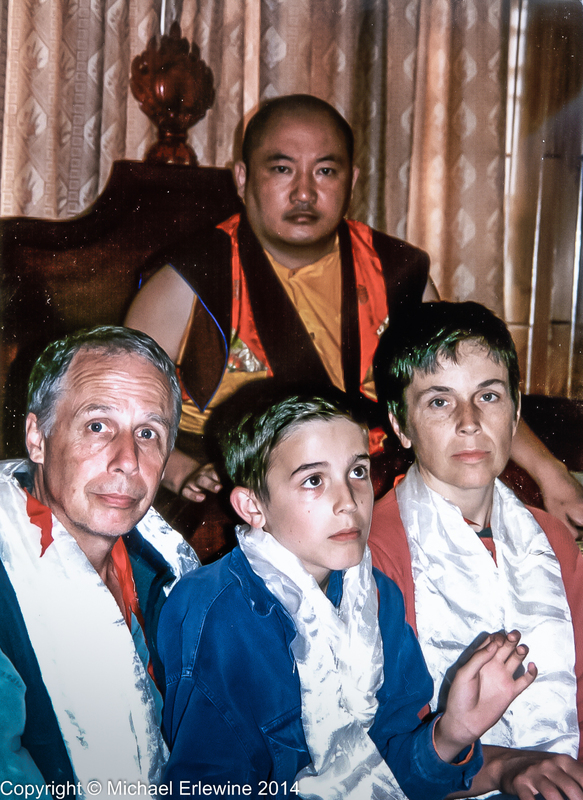 This is a story from our trip to India in 1995, primarily when we traveled to West Bengal and Sikkim where I hoped to request the Vajrapani (Thunderbolt-in-the-Hand) empowerment from His Eminence Gyaltsap Rinpoche, one of my heroes, and said to be the emanation of Vajrapani in our lineage. Many years before I had written to His Eminence personally, expressing my deep desire to take (and request that he give) this particular empowerment. I would always receive back the acknowledgment of my letters, but no scheduled trips to America. Now I was traveling (hopefully) for an audience with Gyaltsap Rinpoche in person. It might be helpful to provide some background to this story. In dharma practice, if we keep at it, we eventually get past beginning meditation practice, work our way through the Extraordinary Preliminaries (ngondro), and finally end up doing what is called our yidam practice, which for many of us becomes a lifetime practice, something very similar in some respects to the Native American practice of choosing a sacred animal. We choose our yidam, the special qualities and deity we resonate with. In Tibetan Buddhism there are many qualities and the deities that we may be drawn to. In my case, I connected rather early-on with the bodhisattva Vajrapani, one of the protector deities of the lineage that is usually charged with protecting the secrets of the dharma from degradation. Since the dharma itself is the truth, it is adamantine, unyieldingly fierce in the face of ignorance and those parts of us that resist change. That is the activity of Vajrapani. As an archivist (and protector) of popular culture (Allmusic.com, Allmovie.com, classicposters.com, etc. ), Vajrapani just felt natural to me. Anyway, for whatever reasons I somehow latched onto Vajrapani as the particular deity that I resonate with, and did my best to learn what I could about that deity and those qualities. Furthermore, I wanted to do that particular practice. However, it is required to be properly empowered for any deity you intend to practice the sadhana of, in this case Vajrapani. The bad news is that it appeared that the Vajrapani empowerment was not generally given, at least not in the circles of rinpoches in which I moved. So of course I cast about for information as to where I could get such an empowerment and from whom. I eventually found out that one of the four heart-sons of the Karmapa (also called the Four Eminences or regents) is considered the emanation of Vajrapani. This is His Eminence Goshir Gyaltsap Rinpoche, who is said to embody the activity of Vajrapani within our lineage. That was the good news. The bad news is that Gyaltsap Rinpoche lives in Sikkim India, and almost never travels. He was like a yogi and not likely to be coming to a monastery near me any time soon, much less offer that empowerment. As mentioned, His Eminence Gyaltsap Rinpoche is more of a yogi than the average lama in our lineage, spending most of his time in practice and semi-retreat. Because of the various problems within the lineage, he has also been the main lama to watch over Rumtek Monastery (the seat of His Holiness the Karmapa in India) all of these years. Not given to small talk or to superficial gestures (he is not much on smiles), Gyaltsap Rinpoche just stares at you straight on, so I was told. There he is; what you see is what you get. I always identified with him because I am much the same way, at least not given to laughter for laughter's sake. Perhaps it would be of further help if I explain something about the Karmapa and his four heart sons, the eminences. The head of the Kagyu lineage, the Gyalwa Karmapa is now in his 17th incarnation, and his name this time is Ogyen Trinley Dorje. Each Karmapa usually has four principal students, called his heart sons or regents. Each Karmapa then empowers these four regents with the transmission of his mind teachings. He literally pours his knowledge and the teachings into the minds of these four students (heart sons) when they are young. Then, when the Karmapa passes on, he leaves a letter telling these four heart sons where he will be born, sometimes the names of his parents, and often in what direction he can be found. The Karmapa is the only reincarnate lama to do this, the 17th in the lineage. In the case of the Dalai Lama (the 14th to date), the successive Dalai Lamas are selected by a committee, who present possible young candidates with the rigorous test of having them choose from a variety of ritual implements the correct implement that was used by the preceding Dalai Lama, and so forth. It is more complicated than that, but you get the idea. However, in the case of the Karmapa, as mentioned, a letter is left saying where to find his successor, and various related information. There is no committee. All they have to do is find him. So my point here is that, based on the letter, once the new Karmapa is found, then the four regents (heart sons) are tasked with teaching the young Karmapa what had been passed on to them. They pour the teachings they were given back into the young Karmapa, and so it goes, generation after generation, like leap frog. His Eminence Gyaltsap Rinpoche is one of the four regents or heart sons of the Karmapa, each of which is the emanation of a particular quality and deity. The four regents are: Jamgon Kongtrul Rinpoche, the emanation of the bodhisattva Manjushri, Tai Situ Rinpoche, the emanation of Maitreya Buddha, Shamar Rinpoche, the emanation of Amitabha Buddha, and Gyaltsap Rinpoche, the emanation of the bodhisattva Vajrapani. I have had the very good fortune to meet and personally receive these particular empowerments from all four heart sons themselves. Some years earlier, I had requested the same Vajrapani empowerment from my own root lama, Khenpo Karthar Rinpoche, and to my surprise he agreed to give that empowerment (for the first time that I know of) at our dharma center here in Big Rapids Michigan. Along with the empowerment, I received the lung (transmission) and instructions for practice, and that became my practice for a long while. Along the way our center put that sadhana into a pecha (Tibetan book format) and shared it with others. And some time later Rinpoche asked me to instruct our sangha in that practice, which I did. That is the only time I have done any instruction in the KTD shrine room at Karma Triyana Dharmachakra Monastery, but I have received teachings from Rinpoche for over 30 years there. In 1995, when I knew we were going to India and Tibet on pilgrimage, of course I wanted to visit Gyaltsap Rinpoche and once again request that same empowerment from him personally, since he is the emanation of Vajrapani. And as I rejoin this story, we are now on our way to India, including Sikkim, and that is where His Eminence Gyaltsap Rinpoche lived. We had finally arrived at the monastery of the great meditation-master Bokar Rinpoche in the village of Mirik in West Bengal, where our friend Ngodup Burkhar had been waiting to receive us. Ngodup was worried when we did not show up on time. When we finally showed up, two days late, he must have realized that we were not exactly savvy travelers in India. Probably worried about our fate, he immediately volunteered to join and guide us for the next week on our pilgrimage. We owe a lot of the success of our India trip to our dear friend Ngodup Burkhar. Ngodup previously served as translator and attended to our teacher Ven. Khenpo Karthar Rinpoche for over twelve years, so we knew him well. He was living in Mirik, where he was then translating for the Ven. Kyabje Bokar Rinpoche, who is considered the spiritual heir (heart-son) to the great yogi Kalu Rinpoche, holder of the Shangpa Kagyu Lineage. Bokar Rinpoche is considered one of the main meditation masters in the Karma Kagyu lineage. There is no way I can thank Ngodup for this kind of sacrifice and the gift of his self and time, not to mention that he is one of the most fun people to be with that I have ever known. I have always wondered about and been on the lookout to possibly encounter a bodhisattva in whatever appearance he or she might make. It is my firm belief that Ngnodrup Burkhar is such a person. With that said, on with the story. From Mirik, my wife, son, and I headed out of West Bengal India for Sikkim along with Ngodup and our driver, but we never really went back down to the steamy lowlands. Instead, we clung to the narrow ribbon-like mountain roads from village to town and onward. The roads were slippery and frequently fog and mist covered, really only space enough for one vehicle, so there was lots of stopping and backing up to let some other car or bus pass. We were heading for the Sikkim border and then on to Ralang and the monastery of His Eminence Gyaltsap Rinpoche. We soon found ourselves driving through large tracts of tea plantations, gardens, and into a vast rain forest, complete with insects singing, ferns growing…all of it wet, wet, and ever green. This was the tail end of the monsoon season and the rains were just beginning to diminish. But for us, the roads got worse, with landslides and at times entire sections of road missing. Local road crews, with shovels and picks were everywhere, trying to keep up with the sliding mud. As we traveled the final stretch to the monastery, such a large section of road had slid away that we had to creep (with breath held) over what little road remained, clinging to the cliff-side in our jeep, with one set of wheels edging over the space where the road was missing and a sheer drop awaited, and with all of us on the other side of the jeep, leaning into the cliff. I didn’t care much for that. In fact, I soon learned never to ride in the front seat, because I did not want to see what risks were being taken. We finally arrived safely. Gyaltsap Rinpoche’s monastery was magnificent and huge. Almost brand new, it stood out among the mountains of Sikkim, right in the middle of what seemed like a rain forest or jungle. Huge beetles and moths were everywhere to be seen in the early mornings. Thanks to Ngodrup and our connections with Khenpo Karthar Rinpoche, we were treated like old friends, given the best of rooms, and fed often and well. Gyaltsap Rinpoche’s personal attendant even ate with us and insisted on showing us around the monastery complex himself. Aside from the main shrine hall, where we were able to practice, we saw the special shrine where His Eminence does the red-crown ceremony plus the exquisite apartment they have built for His Holiness, the 17th Karmapa, whenever he may happen to visit. At that time the Karmapa was essentially a prisoner in his ancestral monastery in Tibet. What a great spirit there was at Ralang, with everything new, and the energy level high. The gompa (main shrine hall) and additional shrines were all exquisite, and we even got a chance to see the dharmapala (protector) shrine, which was not yet completed. For this, they had brought in a master sculptor who then lived there for some extended period of time to create the most beautiful Mahakala statue I have ever seen. About 6-7 feet tall, it was hand fashioned from clay and had yet to be painted. As you can see from the picture, it is exquisite and complete to the last detail. This was one of about ten different statues that this craftsman had sculpted. I have never seen anything better. They were awesome. That first afternoon we were there we had a brief interview with Gyaltsap Rinpoche, during which I formally requested from him the Vajrapani empowerment, one of my main practices. As mentioned, I had written to Rinpoche over the years, inviting him to visit our center, and had always dreamed of receiving this empowerment from His Eminence himself, since he is the emanation of Vajrapani in our lineage. And even though his schedule was very tight, His Eminence agreed to give that empowerment the next morning. And so it was. In his private quarter, my family and I received the Vajrapani empowerment "Dorje Tumpo," a wrathful emanation of Vajrapani and part of a cycle of empowerments originally gathered by the 9th Karmapa, Wangchuk Dorje. Our stay at Ralung was, for some reason, very full of meaningful events, both large and small, sequenced back to back. Moreover, the food was great or we were 'tasting' great at the time. The giant beetles and moths and the closeness of the rain forest lent an almost unworldly (at least for Midwesterners) feel to the visit. The place was charged and we were up to it. The memory, even today, remains clear and present – a very special time. Aside from the empowerment, watching the lama dances in the very early morning fog made a deep imprint.